Miai is not only an observation, something nice-to-know. Miai can be an effective tool when looking for a move. One cannot assume thoughtlessly that two moves are miai, but doing so can lead to the right move, and reduce the amount of thinking over a problem. This diagram comes from Gokyo Shumyo, Section 1, Problem 1. When White plays (mistakenly), an eye is created at the circled points. It is obvious that White could make a second eye at a if White was able to play at . So Black plays at in order to prevent that. This is quite an obvious move for Black. If White plays at here (mistakenly), the right place for Black to kill does not jump to the eye as easily as in the previous diagram. Each of a, b, c and d deserve several seconds of thought... unless one thinks of the concept of miai. At this stage it is again obvious that, if White plays a, Black plays b. ... Black answers at - again using miai reasoning. The shape is a bent four in the corner and White is dead. 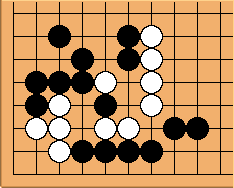 The goal for Black is to separate the white stones. Obviously, this would generate a big profit for Black (territory in the corner and prisoners). How? is the suji making respectively miai of a and b for connecting to the upper black group, and miai of c and d for cutting. Of course, these points aren't strictly equivalent, since both players now want a and c in order to minimize loss/maximize profit. This is a mere detail compared to what is at stake. But it does provide an "additional reason" for playing it out. If played out correctly, each player will get one play of a miai pair. In this example, because it will be White's turn, we expect that White will seize a and c, leaving b and d for Black. This is a useful example that shows the use of miai for attacking in a not-so-basic position.